Delicious cookery classes focus not only on creative cooking with minimal effort but I also teach students how to achieve maximum style on a budget. 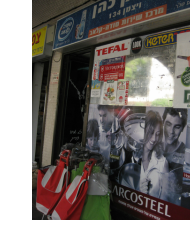 Nearby Kfar Saba is a favorite shopping destination of mine - as my regular students will confirm - and these are my favorite shopping haunts in this tree-lined main street. 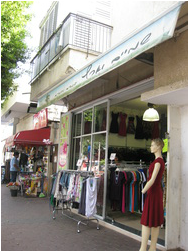 Watch this space for Ultimate Shopping Guides to Tel Aviv, Raanana, Hod Hasharon and Netanya. In the meantime enjoy this virtual shopping tour with me. If you haven't yet discovered the Delicious difference - or if you haven't attended a workshop in awhile - then I hope to welcome you in person to a Delicious! workshop soon! 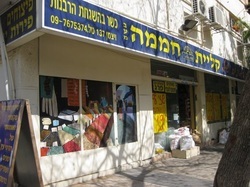 Yitzchak Cohen was the reason I first ventured into Kfar Saba and I suggest that you too make this treasure trove your first stop on your Kfar Saba exploration. First appearances are deceiving , and I urge you not to panic when you reach the door of what appears to be a tiny, electrical goods store , and assume you've come to the wrong place. Instead, walk straight through the store, where you'll find a staircase to Heaven. This bargain basement retailer stocks ALL the brands you'll find in pricey stores like Doma, Taste and Spices at 1/3 off the average retail price if not more. Pots, pans, crockery, cutlery, plastics, napkins, speciality kitchen gadgets and bakeware jostle for space alongside ironing boards, tablecloths, clothes drying racks and sanitaryware. You do have to know your prices to be sure you are getting a good deal - I must say that I don't find the electrical goods especially competitive - but I rarely find prices here to be higher than elsewhere. I'd imagine too that if you DID find something here that you consider over-priced then the owners would be willing to negotiate as they have a reputation to protect. 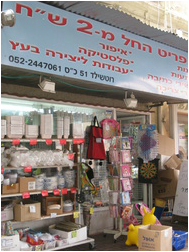 You may want to buy a shopping cart as you leave - priced from NIS 59 - as you are likely to need it today. Closed for lunch and Tuesday afternoons and chaotic around chaggim. 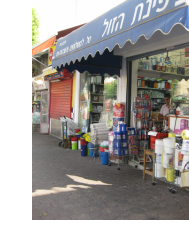 In addition to a wide range of disposable goods - including hard to find items like tiny clear plastic forks and spoons - this little store also sells brand name toiletries and cleaning materials at 20% less than supermarket prices. Be sure to buy a roll of the white, cloth-like wipes in the vats just outside the store as I find these reusable wipes invaluable in the kitchen and far more hygienic than the standard, yellow kitchen cloths. Discounted disposable goods and substantially reduced cosmetics and cleaning materials. 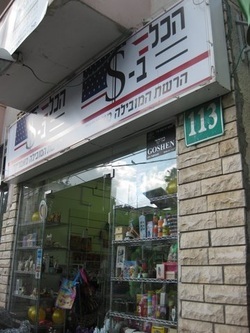 I have to be honest and say the range at The One Shekel Shop isn't as good as it used to be but, with virtually everything in the store priced at just NIS1, it's still well worth a visit. Items to look out for here include colourful, fabric butterfly pins which look wonderful on succah walls, used to decorate little girls' bedrooms and attached to gifts. If you're lucky .and stocks are good, then you can also buy snack packs of Oreos, Hershey's Kisses, Reece's Pieces, Kitkat and even mini Toblerone chocolates at just NIS 1 or sometimes less. Turn left as you walk out of Yitzchak Cohen and within a few metres you'll be at the entrance to Shemyim 'v Aretz women'sclothing store. Owner Iris has her own designs especially made up for her in the Far East and I really can recommend her clothing in terms of figure flattering fit and lasting quality. The range consists mainly of tops, skirts and dresses in a stretch fabric, and most of the items are plain jewel colours, which can be easily dressed up for special occasions. What I like best is that, unlike at most clothing stores in Israel, these garments are fashionable yet don't appear to have been made for anorexic teenagers with a tendency towards exhibitionism. Range includes garments that are suitable for the more modest dresser. Great deals on bras, underwear and pyjamas. Socks at NIS 6 for 3 pairs make them practically disposable. Turn left as you exit the One Shekel Shop, cross over at the traffic lights and turn left into Rothschild Street. Continue straight past the Penguin ice- cream shop - which I am told sells excellent ice-cream and is always busy - and cross over the small road to the little shopping centre opposite. Here you'll find Just For You which I found, funnily enough, on the Internet when I was researching the best price on my favorite perfume. You can compare their prices online before you visit - they carry all the top brands - and you should bear in mind that they also sells 'samples' which are unopened, genuine perfumes and colognes in plain packaging which really cuts the costs. 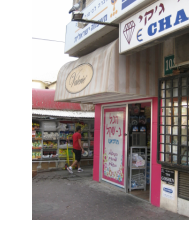 Retrace your steps back to the traffic lights on the corner of Rothschild and Weitzman and, just before you reach the lights, pop into the small 'Two Shekel Shop' on your left with the stands holding disposable foil containers and paper cups on the sidewalk outside. 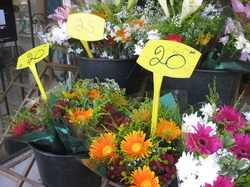 Not everything is priced at 2 shekels but everything is very economical. I'd recommend you go right to the back of this somewhat chaotic store where they sell assorted sized, clear plastic storage containers with clip-on coloured lids. I stocked up on these when I was here and was finally able to properly organise my kitchen pantry supplies as a result. Turn left at the lights and begin walking approximately 50 metres up the hill to 98 Weitzman Street where you'll see a stand of flower arrangements on the pavement outside. You'll pay just NIS 20 for an arrangement of gerberas mixed with chrysanthumums and greenery - see my website for examples of these bouquets - which really is incredible value. Remove the cheap plastic wrapping and rewrap in tissue paper and floral netting - sold at certain disposable stores - and add a butterfly or jewelled pin from the One Shekel Shop for instant gift appeal. I'm sure the owner would also be open to taking bulk orders for events Place these colour co-ordinated bouquets in NIS 10 vases from The Dollar Shop and your party table decor is done. I won't give the body products/make-up store next door at 94 Weitzman its own special introduction but it IS worth a look for Dead Sea body products and a wide range of make-up , hair accessories and brushes . Clothing store 'Stuchi' alongside is also a good option for trendy teens wanting throw-away fashion though I'd recommend that anyone over 18 doesn't make the mistake of trying anything on ..it will just depress you. 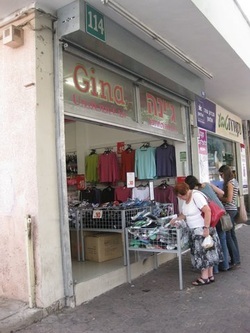 Head a few steps down the hill to the traffic lights - stop at BOOM clothing store at the corner for reasonably priced, high fashion items - and cross Rothschild Street to get to the giant One Dollar Store a few stores down. This is one of the biggest and neatest Dollar Stores I've visited and is especially good for craft materials, vases, fake flowers and the like. 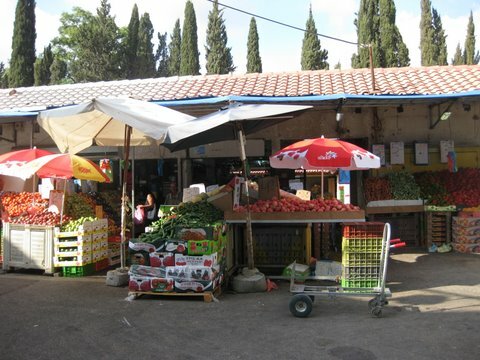 Your Kfar Saba shopping experience is almost done...continue back down the road headng towards the Hertz/Weitzman intersection where you'll find the Kfar Saba fruit and vegetable shuk shortly before you reach the traffic lights on your left hand side. 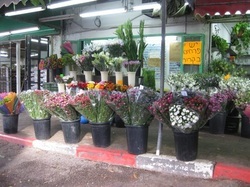 This shuk lacks the eye-candy appeal of places like the Carmel Shuk and Machaneh Yehuda but the prices are substantially lower. Hurry past the pushy clothes seller on the corner - he is unlikely to let you escape easily and will chase after you brandishing items of 70's style clothing that he insists will suit you - and admire the wide range of reasonably priced flowers at the florist on your right. The large store facing you as you come into the shuk - pictured here - can't be beaten in terms of pricing though you have to rummage a bit to find unbruised produce. Don't be put off by the fact that misshapen fruit and vegetables all find a home here as I give you my word that, once you've sliced a lopsided red pepper or chopped a puny apple into cubes, no-one would ever guess that they were once the Ugly Ducklings of the vegetable patch. Just alongside this fruit and veg mega-stand you'll find a herb seller that sells bunches of basil, parsley and mint that are so big you'll be tempted to put them in a vase. In truth, these bunches of herbs are too big for every day use, but bear in mind that leftover fresh herbs can be dried in the microwave or frozen. Explanations for how to go about money-saving processes like this are explained at Delicious! lessons. Retrace your steps back to Weitzman Street, cross Hertzl Street at the traffic lights and continue a few hundred metres down the road to the most amazing spice emporium at 137 Weitzman Street. You'll find every possible spice you could imagine here in this spacious, scented store plus they sell a wide range of imported, speciality sauces, Asian and Indian ingredients, and a wide choice of baking goods. Your Kfar Saba shopping experience is complete....reward yourself for your efforts and spend your last remaining shekels at the falafel stand just a few metres beyond the spice shop where you will find the best falafels in all of Israel. If you enjoyed this shopping guide then you are likely to enjoy my classes too where I focus on high impact food made with minimal time and effort. These great value workshops also include a stylish table setting demonstration and crafts and you can buy almost all the components to achieve the same look right here in Kfar Saba. Happy shopping and I hope to welcome you to Delicious soon!